South Korean multinational company, LG has introduced LG Q7 smartphone in India. It will be available in Aurora Black and Moroccan Blue color only at a price of Rs 15,990 on September 1, 2018. The device operates n Android 8.1 Oreo. 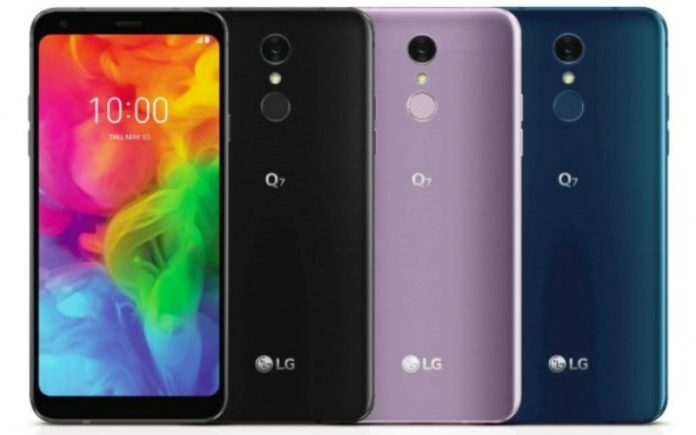 Specifications – LG Q7 smartphone offers a 5.5-inch full-HD+ with a resolution of 1080×2160 pixels FullVision panel with a 442 pixel density and an aspect ratio of 18:9. It has a MediaTek MT6750S octa-core SoC at frequency of 1.8GHz and 3GB of RAM. The device also offers storage of 32GB which can be expandable up to 512 GB by using microSD card and is back up by a 3,000mAh battery. In cameras, the smartphone comes with a rear camera of 13-megapixel sensor with features of LED flash and PDAF and a camera are placed at the front of 8-megapixel wide-angle sensor with video calling and selfies. It has several features such as Wi-Fi 802.11 b/g/n, 4G VoLTE, Bluetooth 4.2 LE, NFC, FM radio, USB Type-C, and a 3.5mm headphone jack. There are several sensors in the smartphone such as rear mounted fingerprint sensor, accelerometer, gyro, proximity, and compass and face unlock sensor. Its size is 143.8×69.3×8.4mm and weight is 145 grams. Other benefits – The LG Q7 also offer IP68 water and dust resistance rating with MIL-STD 810G certification. It also comes with Q Lens in which users improve the image searching and online shopping experience in the camera.